0 Comment March 21, 2019 Like? Each unit of this course will review a different programming language. Each programming language unit will include a review video discussing the pros and cons of each programming method as they relate to robotic camera control. Each segment will consist of a C4 (Camera Control Coding Challenge) segment which will be used for students to test their knowledge on each subject. Finally, in-classroom discussion topics are provided for the full “flipped classroom” blended learning experience. Students are encouraged to watch the “Geek Out Podcast” session with concluding thoughts from the course authors, engineers, and computer programmers, available in the include online Udemy learning course. By the end of the PTZOptics Computer Programming for Robotic Camera Course, students will have a better understanding of common computer programming languages used for remotely controlling robotic devices over an IP network. 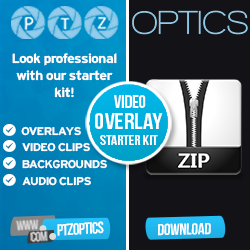 Using a fun live streaming IP-connected camera from PTZOptics, students will have the ability to write custom computer programs which can include live video and robust control over robotic actions. Each example lesson will increase in complexity, as students progress from basic HTML into the more advanced languages. The following videos and course segments will start with the basics of camera controls over an IP network. The course will then move through each programming language, explaining the unique properties of each. Follow the programming language overview sessions, the course will review the importance of GitHub as a central “social coding” destination for your projects. From here the course will dig into the well-documented code provided by PTZOptics available via GitHub. Let’s get started!